Simultaneous rescue and intrascleral tunnel fixation of a dislocated three-piece IOL can be combined in one surgical session.1-4 In four patients, we performed a modified sutureless 27-gauge trocar-cannula approach to achieve intrascleral fixation of dislocated three-piece IOLs. In our variation, only two sulcus-based, tunnel-shaped sclerotomies were created in the pars plicata during the procedure. Both were used for both vitrectomy and haptic fixation. Using the two sclerotomies for both vitrectomy and haptic fixation thus made the surgical procedure simpler and less invasive. 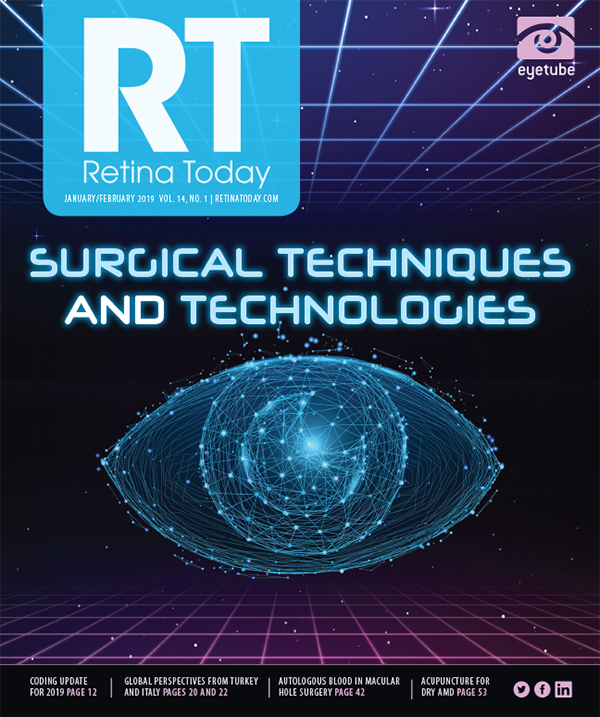 • In this case series report, IOL rescue and scleral fixation were performed with a 27-gauge platform using only two sutureless trocar-cannula sclerotomies. • By reducing the number of sclerotomies, this IOL rescue and fixation technique was less invasive than alternative methods. At the 3 o’clock and 9 o’clock positions, the location of the limbus and the point 1.5 mm posterior to the limbus were marked exactly 180° from each other. Using 27-gauge valved trocar-cannulas (Alcon), we created transconjunctival oblique ciliary sulcus–based scleral tunnels 2.5 mm to 3 mm in length parallel to the limbus, entering the eye through the markings 1.5 mm from the limbus. To parallel the orientation of the haptics of the dislocated IOL, the trocar at 3 o’clock was inserted in a superior-to-inferior direction and the trocar at 9 o’clock in an inferior-to-superior direction. A 27-gauge trocar-cannula anterior chamber maintainer was placed inferiorly through a beveled scleral incision. Vitrectomy was performed using a widefield noncontact viewing system (Resight 700, Carl Zeiss Meditec). The vitreous cutter was inserted through the 3 o’clock trocar to address the inferior half of vitreous cavity and through the 9 o’clock trocar for the superior half. The remnants of the lens capsule were removed entirely from the eye and IOL. After 360° inspection of the peripheral retina for retinal tears, 27-gauge forceps (Grieshaber Maxgrip or serrated forceps, Alcon) were introduced into the posterior segment through the proximal trocar to grasp the target haptic. With the forceps grasping only the tip of the haptic, the IOL was gently moved toward the pupillary area. Next, the 27-gauge cannula was grasped externally with another set of toothed forceps and pulled out along the axis of the forceps. This action externalized the 27-gauge forceps while they still grasped the tip of the haptic. The externalized haptic was retracted as much as possible on the conjunctiva to allow visualization of the other intraocular haptic through the pupil. Using the same sequence of steps, the second haptic was also then externalized (Figure 1). Figure 1. After the first haptic was externalized (green circle), the second cannula was removed with serrated forceps and the other haptic was externalized. Figure 2. The haptic tip was cauterized to create a flange. Flanges were created on both haptics by melting the tips with an ophthalmic cautery device (Figure 2). The haptics were then fixated by pushing them gently back into the scleral tunnels. After centering the IOL and normalizing the IOP, the operation was completed by removing the trocar-cannula anterior chamber maintainer. The sutureless transconjunctival 27-gauge approach we describe above can be used in aphakic eyes without adequate capsular support to fixate a secondary IOL. It can also be used to rescue and fixate a dislocated IOL. As in the case series described here, flanges can be created on the haptics to help hold them in place in the scleral tunnels. In previously reported series, pars plana vitrectomy with intrascleral haptic fixation and vitrectomy required five sclerotomies.5,6 By using two sutureless 27-gauge trocar-cannula incisions for both vitrectomy and IOL haptic fixation, we reduce the number of incisions required for IOL rescue and fixation. Only two trocar-cannula incisions, plus a sclerotomy for an anterior chamber maintainer, were required for the series reported here. This technique thus uses fewer but more functional incisions to reduce surgical burden, rendering it less invasive and simpler to perform. 1. Sharioth GB, Prasad S, Georgalas I, et al. Intermediate results of sutureless intrascleral posterior chamber intraocular lens fixation. J Cataract Refract Surg. 2010;36:254-259. 2. Prenner JL, Feiner L, Wheatley HM, Connors D. A novel approach for posterior chamber intraocular lens placement or rescue via a sutureless scleral fixation technique. Retina. 2012;32:853-855. 3. Bonnell AC, Mantopoulos D, Wheatley HM, Prenner JL. Surgical technique for sutureless intrascleral fixation of a 3-piece intraocular lens using a 30-gauge needle [published online ahead of print November 15, 2017]. Retina. 4. Walsh MK. Sutureless trocar-cannula-based transconjunctival flanged intrascleral intraocular lens fixation. Retina. 2017;37:2191-2194. 5. Todorich B, Thanos A, Woodward MA, Wolfe JD. 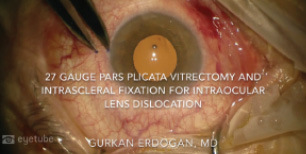 Sutureless intrascleral fixation of secondary intraocular lens using 27-gauge vitrectomy system. Ophthalmic Surg Lasers Imaging Retina. 2016;47:376-379. 6. Prasad S. Transconjunctival sutureless haptic fixation of posterior chamber IOL: a minimally traumatic approach for IOL rescue or secondary implantation. Retina. 2013;33:657-660.